There are roughly ten million displaced persons from and in Syria and 3 million in Iraq. Must they leave their homeland? No. 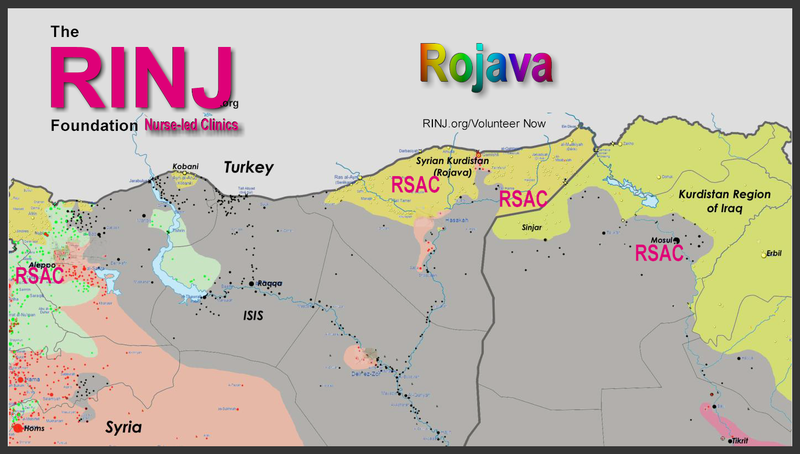 We are kickstarting a program to build 31 clinics across Northern Syria. Please read on. In pursuit of freedom, justice, dignity and democracy and led by principles of equality and environmental sustainability, the Charter proclaims a new social contract, based upon mutual and peaceful coexistence and understanding between all strands of society. It protects fundamental human rights and liberties and reaffirms the peoples' right to self-determination. Under the Charter, we, the people of the Autonomous Regions, unite in the spirit of reconciliation, pluralism and democratic participation so that all may express themselves freely in public life. In building a society free from authoritarianism, militarism, centralism and the intervention of religious authority in public affairs, the Charter recognizes Syria's territorial integrity and aspires to maintain domestic and international peace. ... this is the region that needs our help. What do we do over the next 4 years? Initial team of 20 nurses now inbound to brick-and-mortar facility in Kobane. Second team of 24 nurses to arrive in later after imaging department tele-health centre built to support regional outposts. Delivering Medical services and script fills after 4-days from arrival. Hosted by Canton in 1st 4 days while eng. team roughly fixes building and sterilizes nominal facilities in one section of the building while other work continues. The first of thirty regional mobile clinics arrive with varying capabilities - the first units to Sinjar area or the current priority area of thirty villages in Rojava and eastern Kurdistan (KRI - near Dohuk. RSAC general health care facilities will focus on women and children health care including obstetrics, STD's, infectious disease control, pregnancies, general trauma, overall health care. No patient is turned away, some will be escalated to a hospital. International research provides clear evidence of the correlation of reliable access to effective practices with better population health outcomes. While it is not always possible for a patient to see her own nurse or her other medical team members, efforts are made to ensure that continuity of care remain central to access planning and quality which is why I favour a small leave-behind presence (Two-Staff, Land Rover and Tent) when the Mobile RSAC moves onward in rotation. Establishing wait time targets in basic RSAC care is exceedingly difficult. Therefore, in lieu of setting access targets, we focus on enhancing access, specifically through same-day scheduling for things like pharmacological dispensing, blood tests, inoculations etceteras all done the same day as the face-to-face. Demographics of the population such as age, gender, language spoken, culture, socioeconomic status, and medical complexity determine the number of patient visits within a time line. We tend to favour the Murray and Tantau model which leaves 65 per cent of the day's bookings open for walk-ins or deferrals and 35 per cent booked. The 35 per cent are for patients who 'couldn't make it in on Friday and chose Saturday instead' or 'patients whom the intake deliberately scheduled today for follow-up'. Direct visits, after-hour appointments, and Smartphone communication or other digital follow up can take up shortfalls. The goal is to see all patients scheduled and unscheduled, avoiding as much as possible, long wait times. That's the basic model. Until we have enough units in the field every five days we make a move - the 20ft Units are good for this. The follow ups are pt progress and treatment monitoring. Procedures are only done in the Mobile Units. We really do want to stick to our mission and don't want to get into a bog where we are locked down doing general practice work only. We in this manner focus on finding and regularly seeing as many sexual violence pts as we can. We prevent suicides, quash the spread of dangerous STDs, and collect sexual-violence testimonial and forensic evidence related to law enforcement; and everyone is better served by that focus. The 20 foot units have a 55 gallon water tank and pump system. This allows for one week of water supply at normal usage. Water must be obtained and purified once a week and this is the job of the administrative person. The split a/c is D/C inverted and very efficient. All equipment and lighting is universal power with universal outlets. Solar equipment/system can be programmed for 110 volt - 220 volt 50/60 hz. There are six solar panels that can be permanently mounted on the roof which can produce 1500 watts of electricity. There are eight sealed lead-acid solar batteries which is the primary source of stored power. The whole clinic's average power consumption with all equipment on (including a/c unit) is 500 watts. Even on a rainy/cloudy day our supply verses demand of power is usually 4:1 ratio. Every surface can be disinfected. We use Parkland Plastic Non-frp on the ceilings and the walls. The flooring is Armstrong seamless vinyl and is coved up the walls 3 inches. There is four inches of 1/2 lb icynene expandable foam insulation in the walls and ceilings which in effect gives you a R16 value. Electrical is to international code. Walls are steel studded and Everything is level 1 commercial product. Meaning we have designed our units to be very durable to withstand the most austere environments. x 3 Regional volunteers who speak the language of the locals. K Equipment maint., spares, O2, disposables. The RSACs offer free medical care and community related services such as general medicine, general health care, survivor advocacy, crisis and mass trauma surge capacity, community outreach, & education programs are provided based on each RSAC's resources at the discretion of the local RSAC nurse-led team. We are in Kurdistan and are undertaking an ambitious program to provide health care to thousands of refugees and returning displaced persons. 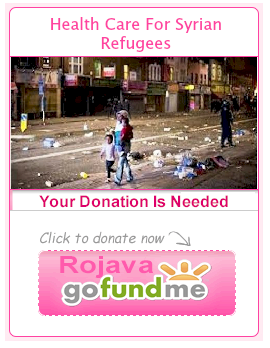 We are looking for serious funding assistance for an aggressive program to provide health care in Northern Syria to Kurdish and Yazidi peoples. x 3 Regional volunteers who speak the language of the locals (cost-to-support). The RINJ Foundation's women's health care nurses at RSAC facilities provide a full range of outpatient & walk-in health care services to patients and provide special care to GBV survivors, infectious disease control cases, pregnancies, small children etc..